First, I want to give you credit for what I thought you did right. OK, I thought that what you did with Jon Snow’s resurrection was actually very well done. You didn’t try to overthink it with all sorts of dialogue. I think that was a good choice. Yeah, he knows he should be dead, and he isn’t, but he can still remember everything about dying. I can see how that would mess someone up. And there’s no sunny flowering meadow with fluffy bunnies and frolicking ginger wildlings waiting for him in the afterlife, it’s just a big fat nothing. He has seen what comes after, and apparently it is that you are dead dead dead. Food for worms, or for the flames to prevent blue-eyed wightiness. Kind of scary. As many people predicted, there are hints that Melisandre will somehow start seeing Jon Snow as Azor Ahai, now that his resurrection has started to rekindle her faith. And Ser Davos has the sense to toss Melisandre out as soon as she starts on with the Red God stuff again. One issue at a time, thanks. Very glad to see Jon not fool around with the people who stabbed him. Was somewhat surprised to see him hanging the conspirators, but I guess that’s easier and faster than chopping off all their heads one by one. OK, objectively speaking, they did kill a kid, but much like Joffrey, Olly is a kid that turned out to be a very unsympathetic character. Besides, Olly is a show-only character, and he has become such a bitter angry little jerk that people are literally cheering his death. And as many people also predicted, Jon Snow took his own death to mean that his responsibility to the Nights Watch is over. After all the anguish and pain it has caused him, I totally understand. Good for him. Now he will have a lot more free time, which we can probably assume he will fill with his new hobbies, or maybe do some sort of self-discovery. I just wonder what Sam will think when he goes through all the trouble to be a Maester only to find out his buddy is no longer even in the Nights Watch. So, now on to the stuff that is freaking me out a bit. Apparently it’s not just me. Lots of people really don’t like where you are taking the Umbers. The Greatjon was steadfastly loyal to the Starks, even after losing his fingers to Grey Wind, and we are supposed to believe that a) he is somehow dead, despite not having seen him since the end of Season One, and b) that his son the Smalljon is somehow the 180 degree opposite of him in terms of loyalty. Really, guys? OK, the Umbers are not major characters in the books or the show, but come on, this seems like a pretty dramatic departure from the books for reasons I am still trying to understand. I really hope that this is just some sort of feint on the Smalljon’s part to sort of win Ramsay’s confidence before they turn on him. I really want to believe that, but you have done something that makes that a lot harder for me to believe: you killed Shaggydog. A lot of people, including me and Kelly, are concerned about your desire to (apparently) slay yet more direwolves. That makes me sad. And frankly, it makes a lot of other fans sad. Sure, Shaggydog was quite possibly the least likeable of the litter of six, but that doesn’t mean you needed to chop his head off and put it on a hook. You could have sent him off to run free like Nymeria. Use your imagination, guys. But no, you had to live up to your Duo of Death reputation. Somehow we are supposed to believe that Smalljon Umber has enough daddy issues that he is going to change centuries, maybe millenia, of tradition supporting the Starks and instead choose the side of the guy who is the most hated member of the most hated house in the North. Because that’s somehow logical and believable. * At least the Karstarks’ choosing the dark side makes some sense, considering what happened in Season Three. But the Umbers? I don’t get it. At least in the books there was an effort to try to make it believable while also showing the divided loyalties within House Umber due to the Greatjon being held prisoner and the Smalljon being dead at the Red Wedding. But you guys just made Smalljon a villain with very little explanation. So unless that was somehow NOT Shaggydog’s head, now we are down to three direwolves of the original six: Jon’s Ghost, Bran’s Summer, and Arya’s Nymeria, who we haven’t seen in the show since Season One. And at this point I am going to go ahead and assume that my original prediction regarding who Ramsay sets on fire at the Battle of the Bastards is probably going to be true. Great. You’re losing me, guys. You’re losing me. I am not going to say that I will ragequit the show, but I think that for the first time I understand the people who have. After a while it just gets to be too much. I just can’t take much more. Seeing how screwed up the actual world is becoming is unbearable enough, without having my escapist fantasy world becoming hopelessly screwed up too. The 2016 Presidential race has become so godawful, with a slew of oblivious, unlikeable candidates fighting to rule over a hopelessly broken system, I am honestly just waiting for it to be over at this point. And Westeros is basically the same thing, but with more swords. Come on, guys, I need something positive to hang my hat on. I hope you are planning to give me the Manderly speech soon, and I hope it’s awesome. 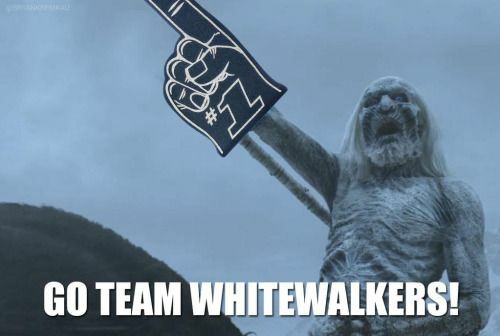 Otherwise I am going to start cheering for the White Walkers to wipe out everyone is Westeros, starting with all those douchebags in the North named Bolton, or following anyone named Bolton. Maybe wiping out everyone in Westeros is a good idea after all. And go ahead and do Essos too, while you’re at it, White Walkers. P.S. I am approaching a point when I don’t even care what happens on Essos anymore, mostly because I am sick of the Sons of the Harpy and all the slavers coming out on top all the time. If I wanted the slavers to win, I would read Harry Turtledove’s alternative history novels where the Confederacy wins the Civil War, ok? Even there, I am getting to a point where I want the dragons to just go nuclear and wipe out everyone. Hell, go all sci-fi and just have some time travelers with nukes show up and put that whole lousy, slave-driving puppy-eating** continent out of its misery. I can’t take much more of that either. *By which I mean the TOTAL OPPOSITE. It is ABSOLUTE CAVE GUANO CRAZY that you guys are making this guy a member of the Ramsay Bolton Fan Club. EVERYONE HATES HIM. He makes his creepy father Roose look kind-hearted and even-tempered. He makes King Joffrey look like a lazy underachiever in terms of violent psychoses. You can’t even wish for Ramsay to go to the Seven Hells because he would just take them over and remake them in his own violently evil image. **In the books, show watchers. Thank God they haven’t tried to show THAT on TV at least. Once again, I’ll have to come back at re-read, to leave a comment. (I say once again, because it’s too late for me to make coherent noise.) As always, I admire your passion and enjoy reading your recaps. Totally valid.